The Index opened flat but saw huge selling pressure from onset to move down to the lows of the day at 8553 but closed a bit higher at 8570.90, huge loss of 63.75 points. The broader market was very weak, with just 314 advances to 1222 declines. Developing Range as per Option Table stays at 8400-9000. Call option 8500-8700 added huge 13.17 lacs OI with profit booking seen at 8800 and above strike prices. 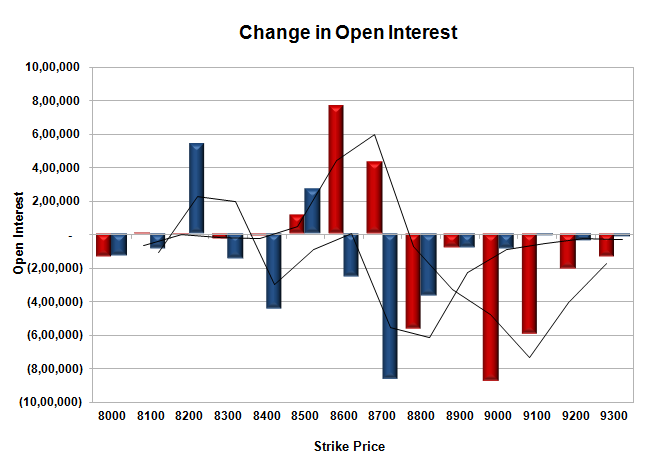 Put option 8500, 8200 added 8.09 lacs OI with short covering seen at 8700 and above strike prices. Nifty Open Interest is at 2,28,97,350 down by 2,03,450, whereas April series added 3.92 lacs with decrease in price, most probably 100% roll-over with huge short build-up. Bank Nifty Open Interest is at 26,14,925 up by 10,175, whereas April series added 0.60 lacs with decrease in price, most probably huge short build-up in both series. FII’s sold huge 6.52 lacs Futures, which includes 8868 contracts long liquidation and 17197 contracts short build-up, with increase in net OI by 8329 contracts (includes 58524 longs to 84589 shorts for the day) and the Average Price comes to 8896.10. FII’s Index future open contract as on date is 742374 Longs to 146167 Shorts, net long 596207 down by huge 26065 contracts. 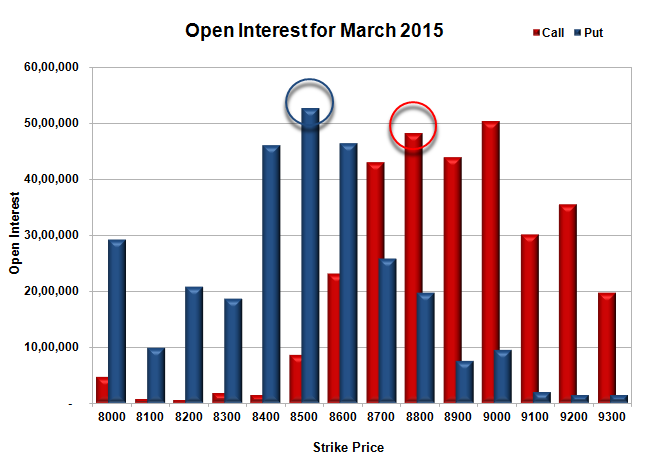 Initial support still at 8600, with OI of 46.48 lacs and below that at 8500 with highest OI of 52.58 lacs. Initial resistance at 8700, with OI of 42.94 lacs and above that at 8800 with huge OI of 48.24 lacs. 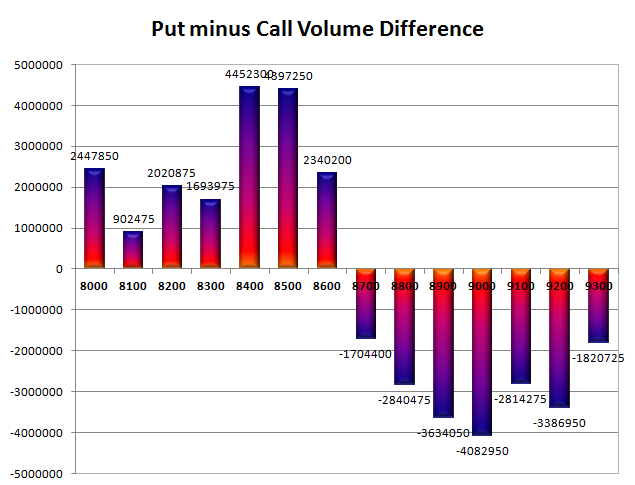 Day Range as per Option Table is 8497 - 8671 and as per VIX is 8507 - 8635 with 8584 as the Pivot.